Kyle and I are putting more effort into the advertising/making-money aspect of the blog. We’ve put up more affiliate links through some posts and created a page of the financial-type products we use. So far no luck with the earning money aspect but I like this approach better than sponsored posts at this point. I’m also way way ahead in my editorial schedule! I have, like, three weeks of posts completely written and scheduled now. It was really the long-distance marriage series that helped me get ahead; I wrote all those posts and sent them out to the participants before putting the first one up. That freed up lots of time to write more guest posts like yesterday’s and I think I work more quickly when I’m inspired to write by the subject matter rather than by a deadline. 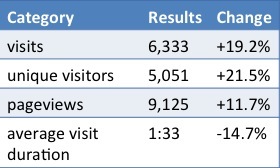 This is our analytics data from April 16 to May 15, 2013. I’m a bit disappointed in our stats, to be honest. 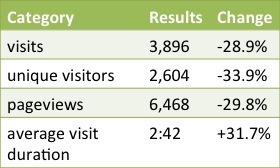 The unique visitors decreased a lot and I think it’s the search engine traffic. Perhaps with tax season ending people aren’t searching for my grad student tax info as much. I’m starting to research what I can do to improve them. As of now we don’t do any SEO and I’m weighing whether to let that sort of thing influence my writing a little. I honestly don’t think my content has suffered (you can tell me otherwise if you like). “loan buying car from out of state private seller” – I did it but it wasn’t straightforward! “phd student why is my income tax refund so low” – A low refund is good, probably. If you want a big refund you have to have more withheld. grad students are still interested in saving for retirement! How much traffic did you have before you started getting income from affiliate links? Do you see unique searches that you can tell are for the same posts month after month? How many posts do you have queued up on average (I’ve been working with 0-1 most of the time)? 17 Responses to "Blog Statistics Update April – May 2013"
Emily, aren’t you earning something from Ally or Discover or Adsense? I’m only earning about $2/mo, but it’s still motivating. I tend to have between 0 and 2 posts queued up. I’ve tried to get ahead, but that’s just how I write. We’re working on getting into the Ally affiliate program. For now, our only money made has been from Adsense. I moved the Adsense ad up higher in the sidebar at the beginning of the month and we are projected to make a little more than previous months. But it’s not a huge amount, just about enough to cover our hosting expenses. Well breaking even aint so bad. I love watching the progression of your blog because I started mine about 1 year after yours, so I’m roughly 1 year behind each of your milestones. Anyway, good luck with the Ally affiliate program. I applied for that about a month ago and I haven’t heard back. Same for me, watching progressions of other blogs started around the same time as ours or within 6 months. I saw that they got pretty differentiated fast, though – some superstars, some burnouts. Different approaches to advertising and commitment to writing/subject matter. After a while it’s hard to compare at all. I still waver between wanting to fit in in the PF niche and developing resources for grad students (hence why I’m thinking of a second site). I had the weeks worth at one point, but I squandered that and now I usually dint have more than the next past queued at a time. This week, I only got one actual post out. I haven’t had the motivation to do anything this week. I haven’t even turned my computer on since Monday! I am pretty committed to my 3 articles per week schedule, so definitely it’s nice to have some posts ready when I have weeks that I’m too busy or too uninspired to write! I’ve squandered a surplus in the past but I’d like to maintain this one! I usually write my post the morning of, but I’ve been working on getting a few scheduled ahead of time so now I’m working on writing the day before. My goal for the weekend is to write a few more articles so I pull ahead for next week. I don’t have any affiliate links on my site at this point, it’s something I’m planning on doing in the future but I want to make a few site tweaks first. Weekends are wonderful for catching up. I like writing these articles so I can do it on the weekend when I need a break from my real work. I need to work on having a bigger backlog of posts. Usually I only have 1 or 2. This weekend though I plan on changing that. Affiliate income has been pretty good for me. Until recently, it was nothing, and now it makes up a big part of my side hustle income. That’s surprising to me! Don’t you post every weekday? I guess you have a staff writer and some guest posts but it’s still a lot directly from you. How far ahead do you want to get this weekend? Are you working with affiliate networks? We’re having trouble getting approved for products we actually want to promote. I started introducing affiliate income a few months back. I need to work on pushing it in more, but I barely have time to get my posts done. I had some traffic drop in April and I am not sure why. I have been trying to figure it out and hopefully I will find the cause. I only want to “push” products that we really like (Ally!!!!!!) and it seems more difficult to make partnerships for those. I don’t want to push random stuff I’m not excited about, though I guess I’m OK with a passive presence. Those kinds of posts would be more difficult to write, anyway, and like you said there is so much to write about just for regular content. Maybe a post-April 15 traffic drop is normal for PF blogs?? I draft a lot of posts, not all of them every see the light of day. I have a ‘topic/theme’ per day, so I have about a month worth of Thursdays queued but Wednesdays must be done on the morning of. It ebbs and flows, I try to make sure I have queued posts when I know work will be busy, so I don’t have an added stress. Re:money. I’m new to blogging (5 months+). My philosophy is a little more naive/holistic/green. It’d be great to make money. But before I fork out for hosting, I want to make sure I’m into posting. And I need to have readers to justify the cost of self hosting (not that I can’t afford it, but it seems logical to make things ‘pay for themselves’ if it’s possible, and it certainly seems it is). I don’t have affiliate links or any other income. I’m just building a stock of posts on things that interest me. And I hope they will become a resource for others – and if not, I have enjoyed documenting my life and tracking my goals etc. I suppose I’m reluctant to be in it ‘for the money’ (and find it hard to hear other people ‘fessing up to that), but it’s just my philosophy on things. I think I will struggle more making money as I am not a niche market – but I couldn’t be topic specific and attempt to publish 5 days a week as I largely am now! Definitely the queued posts are necessary when life gets busy, and it is nice to be flexible to be able to respond to current events sometimes, either in the media or in our personal life. Your approach makes sense to me! Kyle was willing to self-host from the beginning because he’s “always wanted a website to tinker with” so it was moreover spending on entertainment for him than entertainment for me! Plus we got some crazy deal like $10 for the first year and we’ve only recently rolled over to the normal rate. I’m definitely into blogging for the community as well and if we make any money it’s a nice bonus – that’s why I’m not interested in sponsored posts or anything that seems spammy. It’s funny to me that the most money we’ve made is from Adsense, which takes no effort, and indirectly from Republic Wireless, which I reviewed just before they created the referral program so I added it to the already-published post! I can feel your frustration and pain with affiliate marketing and trying to increase blog traffic. I think I can help. I’ve been doing a TON in terms of SEO, and I’ve got a few posts you may find useful. Check out my niche site series because there is a lot of trial and error documentation about what I’ve done to get my latest website noticed. I’ll also have a post about affliate marketing coming up the week of 5/27. Thank you for offering your assistance – I’ve been reading your niche site series but not studying it! I’ll read through again.